1.Please fill in the correct address and phone number, in order to ensure timely delivery of the goods to your hands. 2.If you from Russian Federation,please leave FULL NAME(contain three parts). FULL ADRESS including your STATE and your CITY when you make the order, otherwise we can not be responsible for your parcel if it can’t delivered. Thanks for your understand! 3.If you have question about our products, or you want to cancel an order/open a dispute, please don’t hesitate to contact with our beautiful customer service staff, we are committed to your 100% satisfaction. 4.For IMPORT TAX FEE, we declare orders as gift with low value to avoid it, so usually buyers do not need to pay it. But in some countries, the CUSTOMS officer is very strict for taxes, it will be buyer’s duty to pay. If you find out ways to avoid the taxes, pls tell us , we will do our best to help to avoid it.otherwise we can not be responsible for your parcel if it can’t delivered.Thanks for your understand! 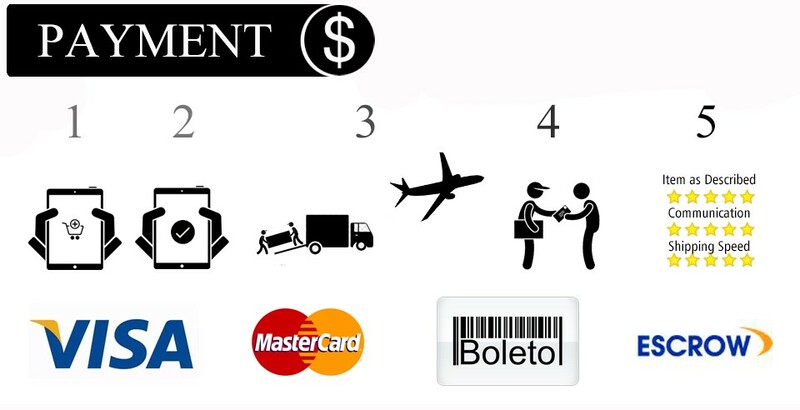 1.We accept Visa,MasterCard,American Express,Moneybookers,Bank Transfer,Worldpay,Western Union,Global Collect Bank Transfer and so on.If you have any question of payment,please contact with us for consult. 2.Please make the payment within 3 days, otherwise you can not be successful to make the order. 1.All the orders are handled within 2 workdays after we received payment,so please pay it ASAP,so that we could ship it out timely after you make order. 2.We are unable to control the delivery time because it is processed by Third-party service,but if the parcel has not arrive within expected time,please contact us,we will help you to track it and give you a satisfied reply. 3.Online tracking available.Tracking website:17track.net/en/ Feedback is important for our store. Before you leave a neutral or negative feedback, please contact us to get a better solution. (it is impossible to drawback the evaluation in new Aliexpress policy) We also regard a NEUTRAL feedback as a NEGATIVE feedback.